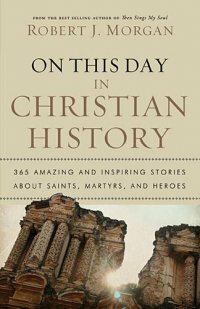 This book gives a brief glimpse into Christian history on a specific day of the year – great if you want to know what happened on your birthday, for example. By it’s nature, it gives a limited perspective on Christian history. If you find a tidbit of information about someone you will need to research elsewhere to find out more. In my opinion this book serves as a quick read to get a person thinking about a topic or time period in Christian history. It functions well as a way to tease the past. The information seems to be accurate and well-written. There is a Scripture on each devotional page. It seems that this book is an updated edition of a book originally published as “On This Day”.